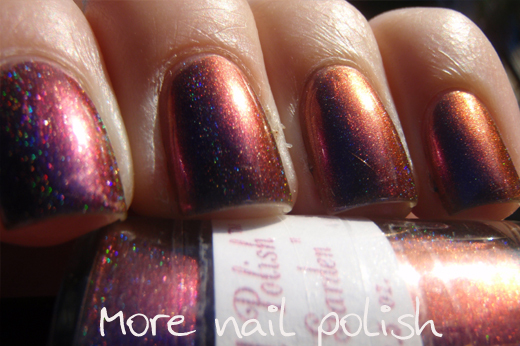 Enchanted Polish Octopus's Garden is one yummy polish. 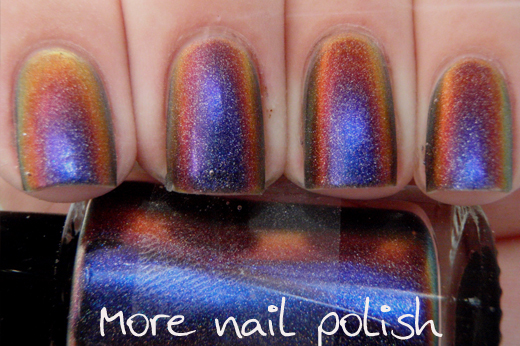 This is a holographic multi-chrome that is dupy of discontinued Ozotic Mish Mash 534. 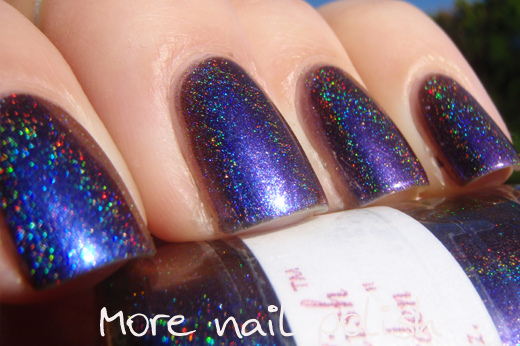 The main different is that Octopus's Garden can easily be built to opacity on it's own using three coats. I love that you don't have to wear it over black and can still get a fantastic colour shift. 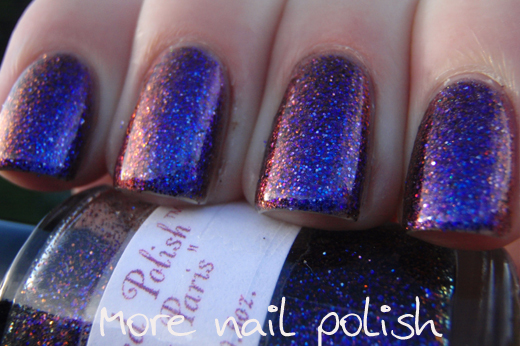 There are a bazillion photos here of this polish - sorry, there is just so much to capture. First I'm wearing three coats with seche vite top coat, taken in full sun. Now the outrageously duo-chrome under water shots. You can see I wrapped some sticky tape on the labels so they didn't get ruined. Nothing else fancy going on here - no photo shopping, just fingers in a bowl of water. Next I added a layer of Bonjour, Paris - which is a dupe for discontinued Ozotic Elytra 529. 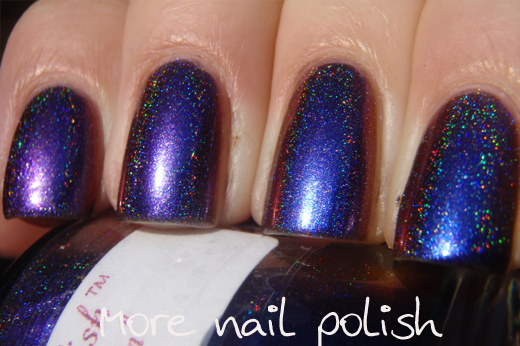 So Bonjour, Paris = Ozotic Elytra 529 = Hits Afterglow, but here is the reason this polish is better. It's full sized and the glitter payoff is amazing. 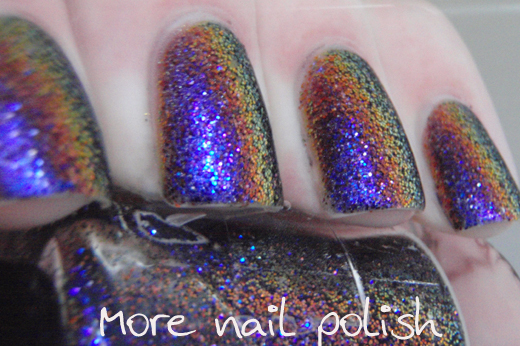 Both the Ozotic and to some extent the Hits polishes are a little sparse with the glitter. Bonjour, Paris is packed with glitter and I only needed one coat to get a good glitterly cover. 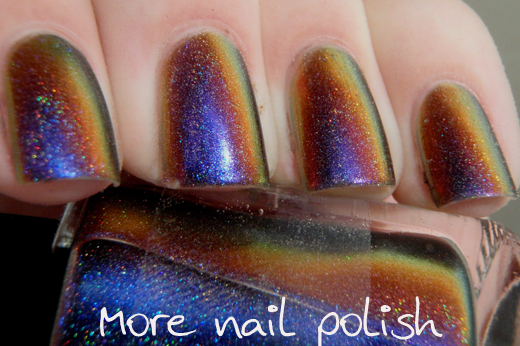 Again, here are the crazy underwater duochrome shots that really show off the shift in this glitter. 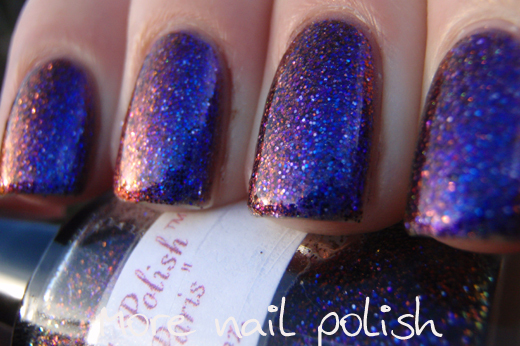 Enchanted Polishes are available from Llarowe, Harlow & Co and Mei Mei Signatures. 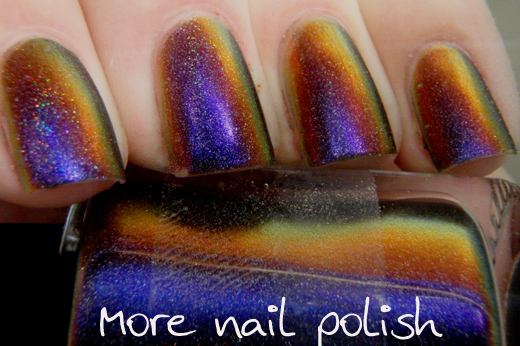 Wow, that is an amazing polish! 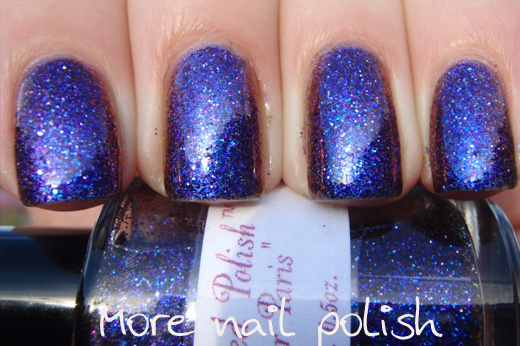 Too bad it is sold out at Harlow & Co. Maybe the polish is worth $20! Wow, so pretty, love octopus's garden. The water shots are amazing. So jealous that you have these! Wow! 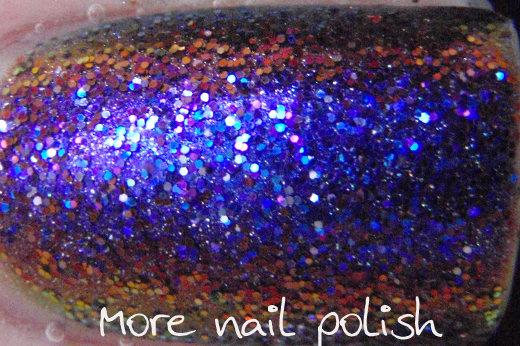 These polishes are amazing, such great underwater photos too! Well done! 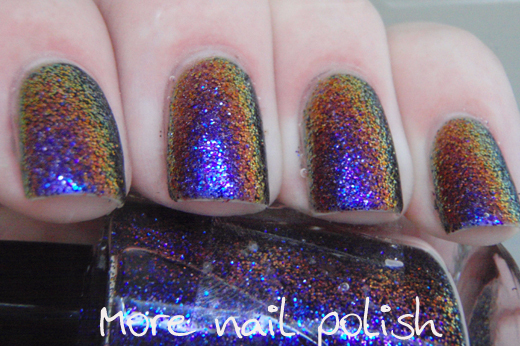 I'm super jealous that you have these lovely polishes in your collection! brilliant idea using water for stunning effect! !